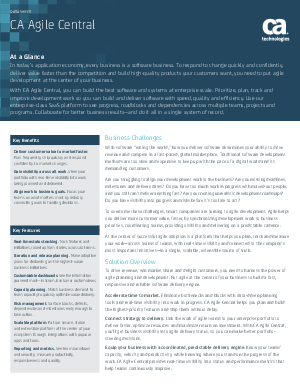 With CA Agile Central, you can build the best software and systems at enterprise scale. Prioritize, plan, track and improve development work so you can build and deliver software with speed, quality and efficiency. Use our enterprise-class SaaS platform to see progress, roadblocks and dependencies across multiple teams, projects and programs. Collaborate for better business results—and do it all in a single system of record.